Entertainment at wineries and vineyards in New York requires a unique set of skills that THEY improv has developed over years of successful events. We have a variety of options to fit most any group on Long Island, in the Finger Lakes, in the Champlaign Valley, along the Hudson River, on the Niagara Escarpment and around Lake Erie and elsewhere. With improv comedy, stand-up, game shows, murder mysteries, Emcees and fun characters, there's virtually no limit to our ability to enhance your events upstate or even in the city. With a variety of improv comedy and stand-up options to fit almost any audience, there is no shortage of laughter at a THEY improv event. With options allowing for our actors to entertain groups, for audience members to participate or to have added team building elements, there is no mystery to your success. Companies have been choosing more and more to take their groups to wineries for team building events. THEY improv has many options for entertaining groups while helping them to bond and develop skills. Fun competitions can bring people together and provide a bit of spice to any wine tasting. THEY improv provides various game shows based on TV shows as well as some special proprietary ones. Wine tastings are taken to the next level with a variety of entertainment options beyond the traditional. From Emcee-ing to providing fun characters, THEY improv enhances the aftertaste of any event. 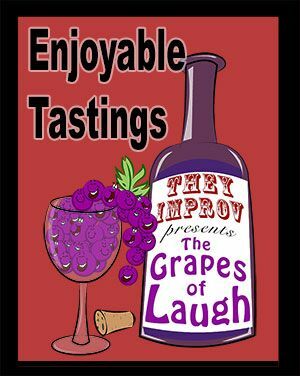 Learn more about how THEY improv became a national leader in entertainment options and began performing for a variety of wineries and vineyards. New York has a great reputation for facilities to attend tastings and the venues are considered prestigious in the options for corporate offsites and retreats. Choose one of the options above to find out more about our entertainment options for corporate events, banquets and private parties. This can include meetings and incentives events, awards gatherings, or simple celebrations. The New York Vineyards and wineries on Long Island, in the Finger Lakes, in the Champlaign Valley, along the Hudson River, on the Niagara Escarpment and around Lake Erie and elsewhere have been very popular for weekend or afternoon getaways as well as destination weddings. We can bring great options together for such family gatherings as well as to enhance wineries and tasting rooms. The tasting rooms of NYC have become popular options for quick corporate events and we have great programs to serve these companies as we have in so many other venues over the years. While you wouldn't consider the city as a place for growing the wine, the culture of wine comes to the city. With so many quality wine rooms around the state, it's no wonder that so many companies choose to go to the area tasting rooms for their entertainment and team building activities. There is no shortage of great locations around major urban areas to hold an offsite for companies throughout the state. For more information about the venues, you can visit the New York Wine and Grape Foundation. Simply contact us to find out how The Grapes of Laugh can come to your venue. This includes working on single events for private clients or for regular public shows that can bring attention and guests to your venue. You can contact THEY improv by phone at 866-219-4386 or email us at info@grapesoflaugh.com.